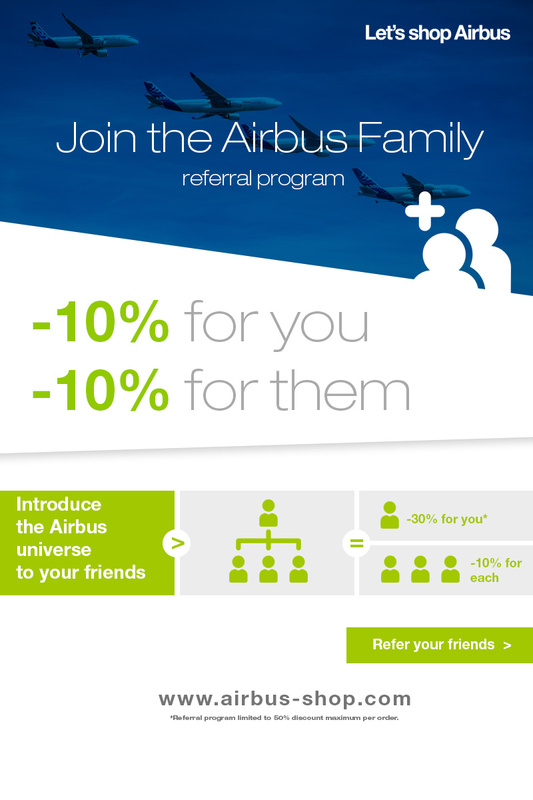 You can sponsor your friends on Let’s shop Airbus ! 1. Sponsoring is effective once the sponsored friend creates his/her account for the first time & makes a first order for a minimum amount of 20 € on Let's shop Airbus by clicking the link on the invitation mail. 2. The godfather/ sponsor will then benefit a 10% personal voucher code available on all the Website (Shipping costs excluded). This voucher is available 1 year starting from the day of the payment confirmation from the sponsored friend. 3. 5 maximum friends can be sponsored. The sponsor can benefit up to 5 discounts of 10%, or 50% maximum discount for an order. 4. Let's shop Airbus keeps the right to close the account of the sponsor or the sponsored customer and demand a full payment if a fraud is detected. You can see all your vouchers in "My account" section "My vouchers".